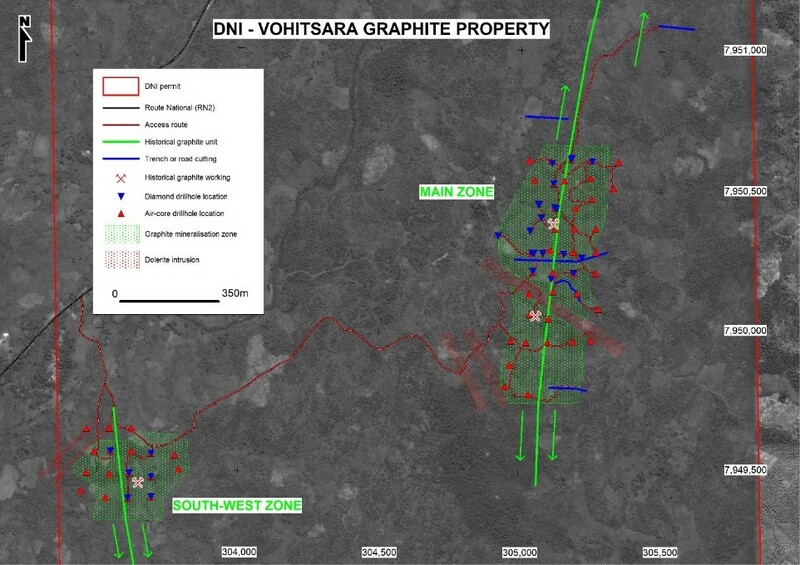 TORONTO, ON / ACCESSWIRE / April 2, 2019 / DNI Metals Inc. (CSE: DNI; OTC PINK: DNMKF) (“DNI” or the “Company”) is very pleased to announce the results of its initial National Instrument 43-101 Mineral Resource Estimate for its Vohitsara Graphite deposit in Madagascar. A saprolitic deposit is easier to mine and process than a similar hard rock graphitic deposit. Dan Weir, CEO, commented, ”We had indicated to the markets that we would be happy with a 4.0% GC grade, since many of the deposits in our area of Madagascar range from 2.0-4.2% GC, but having a 5.0% GC grade in saprolitic, weathered, host rock is above our expectations. This initial resource is just the beginning, considering we only drilled a small portion of the Main mineralized zone, as the resource is open ended along the north-south strike length and down dip to the west. With the release of the resource, and the expected environmental licences not far behind, DNI can focus on constructing its Pilot Plant. Operating cost per tonne U$323.00 graphite concentrate. Mineral resources constrained within a Whittle pit shell. While the assumptions used for the mineral resource estimate generated a in-pit mineral resource based on a 1.5% GC cut-off, DNI has decided to use a 3.0% GC cut-off for the base case resources to better demonstrate that there are reasonable prospects for eventual economic extraction. The sensitivity table outlining the mineral resources at various cut-off grades above and below the 3% GC base case allows DNI to determine the potential impact on the resources should efficiencies be identified in further studies. The drilling program on the Main zone that was completed in 2017, covered a length of approximately 750 metres. The Main zone is open ended. The Marofody project has historical production. It has historical mapping to show the possibility of multiple mineralized zones. Further testing is needed, and will commence in 2019, to analyze these zones. 50kms to Madagascar’s main port, on a paved road. This part of Madagascar sees high annual amounts of rainfall and a hot climate, which weathers the rock in a saprolitic form, making the mining and the processing of the material easier than hard rock. Two operating graphite mines in the area. One 20 kms north, and the second 50 kms to the south. The Mineral Resource Estimate was prepared by Micon International Limited (”Micon”). The effective date of this Mineral Resource Estimate is April 2, 2019, and it is based on DNI’s Main zone defined by 4 trenches, a road cut, 22 diamond drill holes and 38 R/C drill holes up to December 31, 2017. Leapfrog Geo 4.4.2 software was used to construct a three dimensional (”3D”) solid models. Mineral Resource categorization was applied using both variography and geometric criteria, i.e. spacing between drill holes/assay composites. The Technical Report to disclose the Mineral Resource Estimate is being prepared in accordance with National Instrument 43-101 (”NI 43-101”) and the CIM Standards for mineral disclosure by Micon. This Technical Report will be filed on SEDAR (www.sedar.com) within 45 days of this press release. The samples were processed at AGAT Laboratories, in Ontario, Canada. Graphitic carbon assays were performed using a modified infrared assay method. This method is preferable to other industry-accepted assay methods; inclusive of varying forms of Loss on Ignition (LOI) testing. All analysis was preformed using LECO instruments. The Mineral Resource Estimate contents of this press release have been reviewed and approved by William J. Lewis, B.Sc., P.Geo. and Charley Murahwi, M.Sc., P.Geo., Pr. Sci. Nat., FAusIMM, both Senior Geologists with Micon. The scientific and technical information pertaining to the exploration work mentioned in this press release has been reviewed and approved by Jannie Leeuwner, BSc (Hons) Pr.Sci.Nat. MGSSA MSEG, from Vato Consulting, whom is a Qualified Person as defined in National Instrument 43-101. Photos of +500 µm from the high-grade concentrate shown in Figure 1 reveal flake dimensions to be often in excess of 2 mm. The process flowsheet included rougher flotation, followed by several regrind and cleaner flotation stages. Flotation testwork based on IMO’s standard graphite process flowsheet resulted in a high-grade concentrate from both low and high-grade composites as shown in Table 1 following. Comparison of total graphite carbon and total carbon assays shows that all carbon in the samples tested is present as graphite. Open circuit total carbon recoveries from both tests were excellent at >85%; with improvement expected upon recycling of intermediate tailings streams. Total carbon losses to expected reject streams were <7%. These recoveries bode well for future testing of the current drill program samples. Results from two metallurgical samples recently submitted to Metallurgy Pty Ltd (”Metallurgy”) and managed by Independent Metallurgical Operations (”IMO”) in Perth, Western Australia. Samples used were collected from selected site within the Vohitsara Graphite Property in Madagascar. The flotation test work, based on a standard graphite process flowsheet developed by IMO, demonstrated that coarse high purity graphite flakes can be produced from this standard flowsheet. This press release contains forward-looking statements, including statements that relate to, among other things, the following: (i) the geological characteristics of the projects; (ii) the potential to discover additional mineralization and to extend the area of mineralization; (iii) the potential to raise additional financing; and (iv) the potential to expand and upgrade the resource estimate of the projects. Forward-looking information is subject to the risks, uncertainties and other important factors that could cause the Company’s actual performance to differ materially from that expressed in or implied by such statements. Such factors include, but are not limited to volatility and sensitivity to market metal prices, impact of change in foreign exchange rates, interest rates, imprecision in resource estimates, imprecision in opinions on geology, environmental risks including increased regulatory burdens, unexpected geological conditions, adverse mining conditions, changes in government regulations and policies, including laws and policies; and failure to obtain necessary permits and approvals from government authorities, and other development and operating risks, and can generally be identified by the use of words such as ”may”, ”will”, ”could”, ”should”, ”would”, ”likely”, “possible”, ”expect”, ”intend”, ”estimate”, ”anticipate”, ”believe”, ”plan”, ”objective”, ”hope” and ”continue” (or the negative thereof) and words and expressions of similar import. Although DNI believes that the expectations reflected in such forward-looking statements are reasonable, such statements involve risks and uncertainties, and undue reliance should not be placed on such statements. Certain material factors or assumptions are applied in making forward-looking statements, and actual results may differ materially from those expressed or implied in such statements. Additional information about material factors that could cause actual results to differ materially from expectations and about material factors or assumptions applied in making forward-looking statements may be found in the Company’s most recent annual and interim Management’s Discussion and Analysis under ”Risk and Uncertainties” as well as in other public disclosure documents filed with Canadian securities regulatory authorities. Forward-looking statements are provided for the purpose of providing information about management’s current expectations and plans relating to the future. Readers are cautioned that such information may not be appropriate for other purposes. The Company does not undertake any obligation to update publicly or to revise any of the forward-looking statements contained in this document, whether as a result of new information, future events or otherwise, except as required by law.